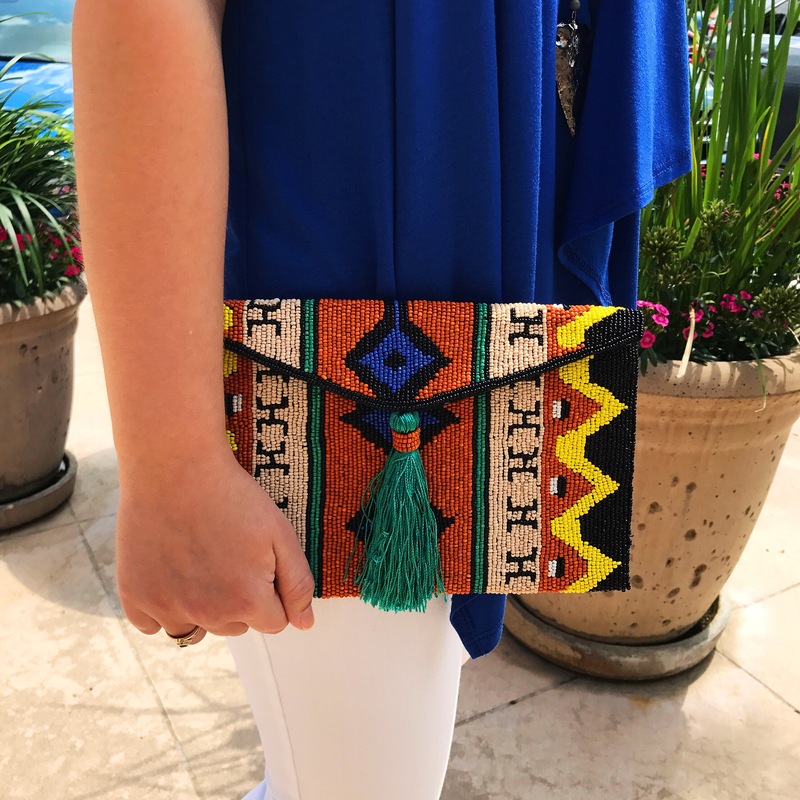 If there is one clutch that I have fallen hard for this summer, it is the Azteca Beaded Clutch by Gretchen Scott. I love the colors that were used, the pattern, the size, and the fact that it is hand beaded. Honestly, with this gorgeous clutch, you can dress up a simple top (like what I did) or complement a lovely dress. Y’all know I am all about pieces that are versatile and this clutch definitely fits in that category. Once summer comes around, I’m all about wearing dresses and tops made of lightweight fabrics, which are a definite must when you live in such a hot and humid area like I do. With that being said, since moving back to the Houston area, I have constantly been on the hunt for brands that use lightweight fabrics while also still remaining stylish. One of those brands that I have found to satisfy my fabric and style needs is Escapda Living. 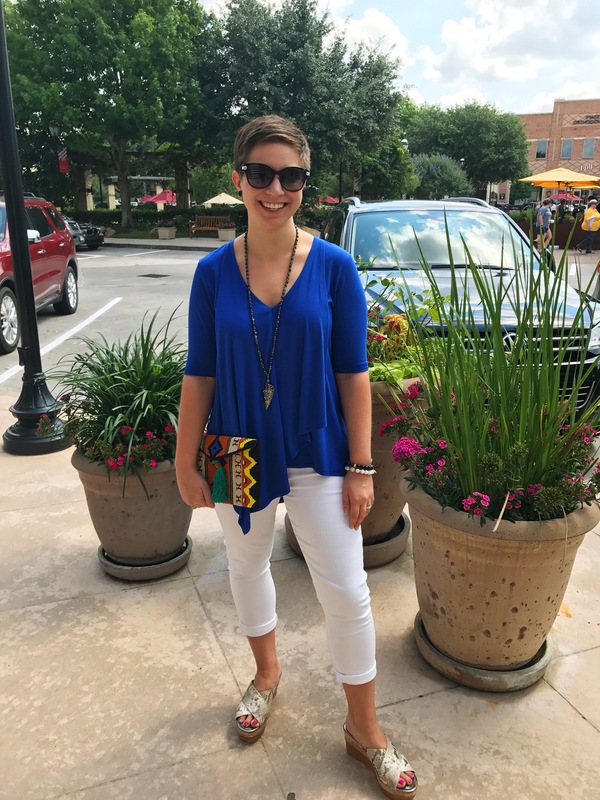 I mean, not only do I love the feel of their pieces, but I also love how the classic cuts of them are styled with either a fun print or some tassels. All of which work perfectly down here in the South! I know I’ve been quite hit and miss when it comes to posting since having gotten back from my trip to the Pacific Northwest and I apologize for that. Things have been crazy here, but I am currently trying to get back to some semblance of a normal schedule/routine. Also, it’s really been feeling like summer here in the Houston area. I’ve already worn my white jeans multiple times and have even been able to get out the bikini as well. Crazy stuff–I know. One brand I’ve come to love recently is Jude Connally and that is because of the saving grace of the moisture wicking material of many of her pieces (like the dress I am wearing above). If there’s one thing that annoys me, it’s when humidity gets my clothes to attack me and luckily that does not happen when you wear Jude Connally. Have a wonderful Tuesday, y’all! Oh there have been so so many inspirational images popping up all over the Internet lately. It’s a fact–Spring fashion, food and weather are all just too amazing. Yesterday I spent quite a bit of time in one of my favorite places, Target. Everywhere I looked there were pieces incorporating some of the biggest trends of Spring, such as nautical, brights, stripes, and nature-inspired. Loved seeing trends that I have spotted on blogs in Target, makes me a happy girl!